What Day Of The Week Was August 12, 1977? 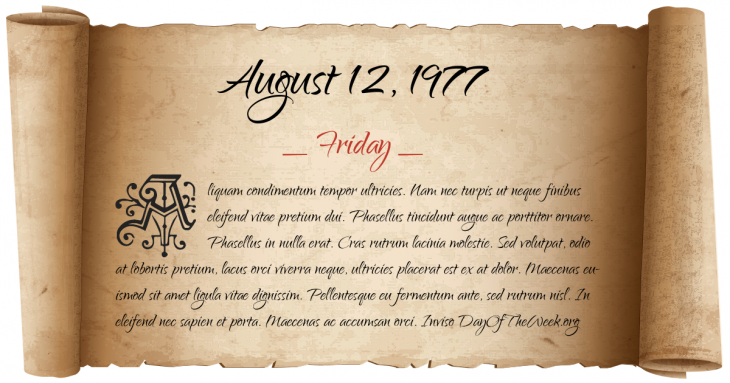 August 12, 1977 was the 224th day of the year 1977 in the Gregorian calendar. There were 141 days remaining until the end of the year. The day of the week was Friday. A person born on this day will be 41 years old today. If that same person saved a Quarter every day starting at age 7, then by now that person has accumulated $3,167.75 today. The Sri Lankan riots of 1977, targeting the minority Sri Lankan Tamil people, begin, less than a month after the United National Party came to power. Over 300 Tamils are killed. Who were born on August 12, 1977?